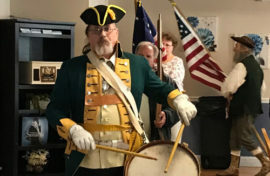 Reading, MA (March 19, 2019) – The Minutemen of Wilmington, MA, recently held their winter meeting at Peter Sanborn Place in Reading. The organization has used this site for many years for their winter meeting, as many former members live or have lived at Peter Sanborn Place and enjoy remaining connected to the charter. Residents were invited to join and partake in the scheduled meeting and Opening Ceremony. A wonderful morning was had by all. 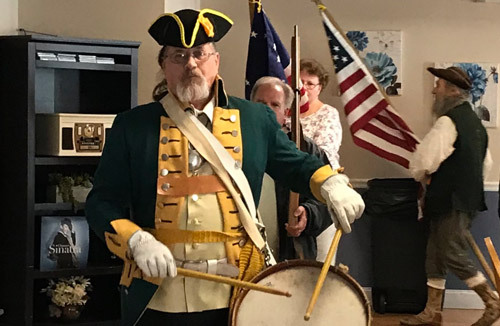 Pictured here is Private Mike Bodnar (with the flag) and Former Captain Mike Kelley (with the drum).